tl;dr Let the kids explore and build stuff, they need to discover the space beyond the school books. Programming is definitely one of the tools to help out with the development of analytical thinking and creativity of the kids. 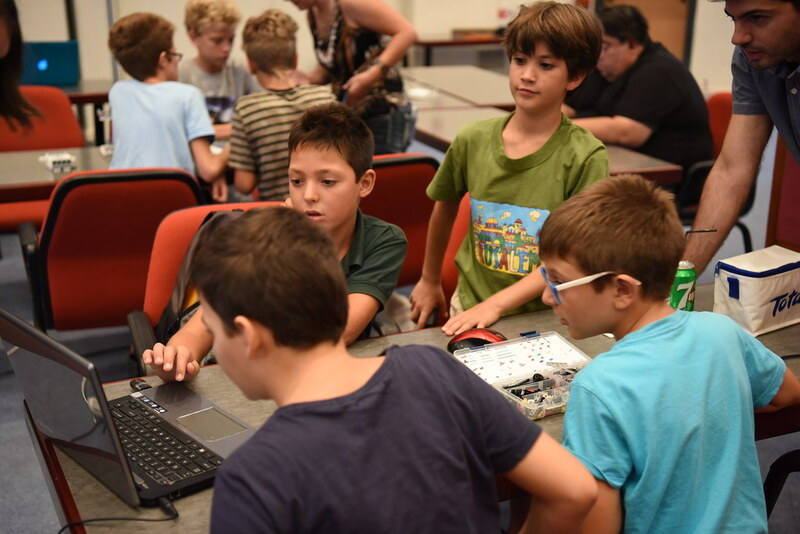 At the beginning of my summer vacation for 2016 I had the opportunity to attend a (turned to be) wonderful coding day designed for kids, namely the JCrete4Kids. I volunteered as a coding assistant that would provide guidance and discuss questions that could come up by the little participants. What was awesome at JCrete4Kids and why do we need more of those? Developing a teamwork spirit in the school years seems to be the objective in nowadays, though only a few real opportunities are given to the students to practice it and I doubt how much this is evaluated compared to self performance by the grading systems across the globe. However, later in the professional career years, being a team player is one of the most requested skills. At JCrete4Kids the little friends were asked to form teams, and in case someone was too shy to join one, the assistants/instructors were trying to bring her/him closer to a team. Working together helps to figure out what each one can contribute to the ultimate goal, to create, construct and hack the most out of the given assignment. Creativity happens in many ways and sometimes it’s completely serendipitous. Experimentation with hardware seems to trigger creativity a lot and when it comes to hacking hardware with kids the results are impressive! The session for Raspberry Pi starts and Stephen Chi asks the little participants what do they do when they want to ask a question at the school classroom. “We raise our hands, Sir”. “Well, here you just shout, we don’t accept pupils that raise their hands!”. The wording could be a little bit different but the core of the instruction was to “shout”. That’s the spirit of kicking off a creative session of hacking the Raspberry Pi. Seriously, those words made me believe that I’m spending the first Saturday morning of my summer vacation with a community and in an event that totally deserves the contribution of my energy. This setup frees the kids to escape from the strict system of the daily school habits and allow themselves to experiment, break things and create following a few basic guidelines and instructions. This freedom allowed the kids to hack the given program beyond the guidelines and experiment in order to explore more than they were expected to accomplish. What were the main points that the little friends took away from the 1-2 hours of hacking with the Raspberry Pi? The kids were mostly without any programming background (at least those that we played together with the Raspberry Pi). Regarding the Raspberry Pi, they had the chance to get the feeling of the very fundamentals of programming by tweaking a given Java game that was actually utilizing concepts of Java 8 like streams, filtering streams, collections, etc. Trial and error helped them to figure out how to tweak the code to address their modification ideas. Before this to happen, they had to assemble the Raspberry Pi with a keyboard and a monitor and to learn about the nano editor that helped them edit the source files. Putting all those things together the little programmers had all the knowledge needed to be able to program on a Raspberry Pi (at least) if the would like to program one in the future. Furthermore, the little coders were able to get the idea of the statements in the program and spot the places they had to modify in order to change some behavior in the game without much help from us! That was impressive and at the same time is the reason (to my humble opinion) that programming in this age should be promoted in the same way as the rest of the courses at the school program. I’m not a specialist in designing educational programs, but I strongly believe that programming puts together in practice all those topics that theoretically kids learn in the school (like math) and in addition it helps to develop their analytical skills and their creativity. In both labs that I participated (Raspberry Pi and Lego Mindstorms), the kids had to figure out what needs to be done to achieve the objective of the exercise or their idea. For example at one of the teams I helped at the Lego session, a special piece was missing to complete the ceiling of the elevator, probably because another team got more than one of the available special Lego bricks. Their solution was to find a simple one with the same size that would provide the functionality (hold a motor) of the one in the specs. Obviously they figured it out (see the picture below) and it worked like a charm! The feeling of fixing the issue was so rewarding for them! They made it work even if it was a bit different than the initial design. Wrapping up my thoughts above, I would definitely encourage parents to enroll and bring their kids to events like JCrete4Kids, at their region, to hack and explore programming and electronics. It’s not about convincing a kid to become a programmer, but to trigger her creativity and analytical thinking; that’s what matters. Big congratulations for one more time to the JCrete unconference and to the organizers and the rest of the team of JCrete4Kids. Great initiative and great event! Looking forward to the next one! P.S. JCrete4Kids, in Chania of Crete, is not the only one that encourages kids to program and get their hands on electronics. I’m aware of one more periodical event, that takes place a few times throughout the year, namely the Schoolspace Chania. However, I never had the opportunity to drop by.